It has taken me countless failed attempts over several years to finally create a delicious salsa. And we love great salsas! It sounds like it should be simple to do, as salsas are fairly commonplace, but there are a few things I've discovered that can ruin a salsa that are not intuitive until you've made the mistake of including them in a salsa. Plus I like my salsa chunky and fresh but still with the right flavor combo and certainly not garishly chunky. So developing my palette and knife skills have certainly contributed. Bottom line, salsa is simple – now that I have actually figured out one way to make a good one! So here it is. This made at least a few cups of salsa, but of course you could adjust accordingly. The first huge key is tomatoes. I had six Roma tomatoes. For each one I sliced off the end and then smushed out all of the insides into the sink. 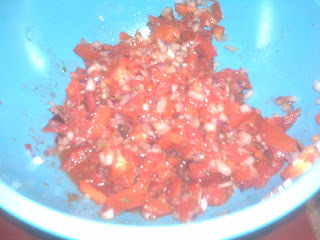 Seeds, juice and slimy membrane of the tomato is the first enemy of a good salsa. The presence of these elements will make your salsa taste funky. Believe me I've done it. Once I had my tomato shells, I diced them into dime-size pieces at the largest and put them into my salsa bowl. I then minced half a red onion as finely as I could. As mentioned yesterday, I think red onion is less overpowering and more flavorful than yellow onion in raw forms like salsa, so that is the second salsa key. You want onion, but you don't want the onion to overpower. This is why I only added about three quarters of the chopped onion at first. I wanted to taste the salsa first before possibly adding more later (I actually did not add more). Next I chopped a small red bell pepper very finely and added it to the bowl. You might not associate bell peppers with salsa, but it adds definite crunch to the salsa and can mellow out the heat that is added later on. You don't want anymore than this, so make sure it's a small pepper or use half of a larger one. Next I added a little bit of chopped cilantro. I am not a huge cilantro person, so it was only a splash since it does add that fresh salsa taste. To continue seasoning, I added a nice large pinch of kosher salt and a lot of black pepper. Then I added a personal touch of a dash of chipotle pepper for heat and smokiness and then two large glugs of habañero hot sauce for the real heat. Of course, the level of heat is up to you, but this was a solid medium. It is also crucial to make sure you remember the salt. Unsalted salsa will not taste good at all. It will cause that rankness that leaving the tomato seeds in the salsa would have caused. Finally, DO NOT ADD RAW GARLIC! So many people, my past self included, have figured or assumed that garlic has a place in salsa. It does not at all, whatsoever. Raw garlic will make your salsa taste like raw garlic and it won't help the rest of your ingredients either. I'm sure it's not unheard of, but there needs to be more acid in your salsa to cut down the pungency of a garlic. Pure and simple, I don't recommend it. Once everything is in the bowl, with clean hands, I mixed all my ingredients, squeezing as I went. This got those juices to mix together and everything to meld well. Done. Quick, simple and it made a lot of GREAT-LOOKING salsa! Since this was me, I get some (good quality) corn chips and chowed down. The taste is just how I like salsa – very flavorful and fresh with just enough heat. And Julia thought it was great too – only maybe a little hotter than she likes. Adjust as you like, but this is the best basic formula that I have been able to create in my test kitchen. So now you have all my personal dos and don'ts for making a great-tasting salsa. It took me a while, but finally!